Huge difference between play count. And Grazer's game has been there since the beginning, so it obviously should have the most plays. How's this possible? 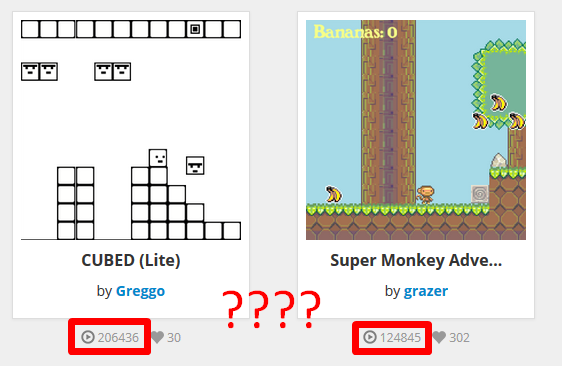 CUBED isn't a bad game, but it's possible that either there is someone that just refreshes the window on play or Greggo posted his game in several communities for allot of people to try. Also Grazers game looks more like an example than a game... so that could be a part. CUBED (Lite) is still pretty good, though @JR 01 , and actually @Greggo , if you want, you could put your game on my discussion, Bored Reviews: forum.flowlab.io/discussion/6828/bored-reviews#latest , and I'll give it a like (If I haven't already) and review it for you! Greggo advertises his games. Grazer help other people out. Also, Monkey Adventure is outdated.